The photo above is of the ambitious and daring set for the opera, "Andre' Che'nier". The opera by Umberto Giordano, set to an Italian libretto by Luigi Illica, is loosely based on the life and death of the 18th-century French poet Andre Chenier, who was guillotined for “crimes against the state” during the Revolution. But the set, oddly enough, is modeled on the visage of another radical poet, Jean-Paul Marat, as depicted in Jacques-Louis David’s, "The Death of Marat". 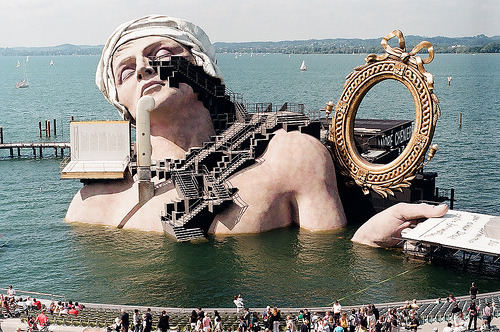 The set is built in Lake Constance, in Bregenz, Austria. It is mounted on a concrete platform and has been water-proofed. "The neck hinges open to reveal a stage of books and a series of zigzagging stairways descend from Chénier’s (Marat’s) left eye. An open book to stage right of the figure functions as a secondary stage, and mobile pieces, including a floating platform, rise in and out of the water over the course of the opera." I would like a few of my tax dollars to support this sort of thing. So much more culturally enriching than another decade of blood and sturm und drang in half a dozen Middle Eastern countries.